Get Marnie’s affection to three hearts. Not too difficult - she likes foodstuffs. Reach the 9th of Fall on the second year. Not positive. If anyone call tell me how they got it, let me know. 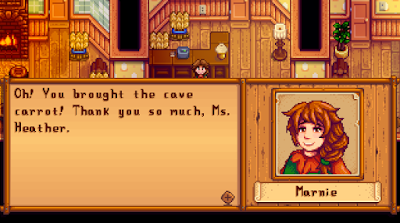 Regardless, Marnie asks you to bring her a Cave Carrot by visiting your farm one morning. Cave Carrots can be found a few different ways in Stardust Valley, but the primary method of doing so is to wade into the Mines and look around until you find one. Most of the time you’ll find Cave Carrots inside crates, though some monsters will drop them as well. You’re most likely to find a Cave Carrot within the first thirty or so levels of the Mines, so you don’t need to go too deep. You’ll gain access to the Mines once you reach Summer of the first year. Take the Cave Carrot to Marnie once you have one. She works at Marnie’s Ranch, south of your farm, from 9 to 6 most days. You must bring it to her Ranch to complete the quest. You’ll gain a heart of affection with Marnie for helping her out. I got this one on the third of fourth of spring, second year, with Marnie at three hearts, so it most likely triggers on three affection. I got this quest the same day I found Marnie's recipe in the mailbox. I triggered this quest on Fall 9 Year 2. Careful! This removed over 30 cave carrots from my inventory! I received this quest, went into the ranch and a cutscene begins, but it crashes my game every time I try.